Khmer-style Prangs at Wat Si Sawai in Sukhothai Historical Park. Made of laterite, they may have been part of a distant outpost of the Khmer Empire (9th to 13th centuries), the capitol of which, Angkor, is in present day Cambodia. 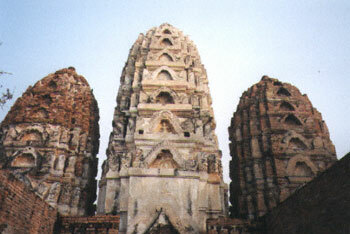 The Khmer prang, or tower, symbolized Mount Meru, mythical abode of the gods. Hindu myths are carved in stone reliefs.